Percussionist Will Guthrie has many albums, both solo works and collaborations, behind him. This nice digipack album, titled ‘Sticks, Stones and Breaking Bones’ is the joint effort of three labels (Antboy Music, Lespourricords and Gaffer Records) who let the wild hands of Guthrie loose, thus resulting in a storming display of power. Guthrie’s intensity can sometimes reach overwhelming climaxes, as well as the opportunity to reach several directions at once. Most interesting of these is on “Sticks”, while Guthrie perfects a tribal, spiritual beating, with a more urban, psychopathic performance. The resulting cultural intertwining makes beautiful and intriguing entrance into the world of Guthrie’s album. Other parts do not fall short behind this; “Stones” reaches the low depths of minimal ambient, where silence is only disturbed by seemingly random low thunders, yet as one can imagine, a storm is a brewing, and “Stones” develops into a much more punishing opus in this great album, and, as much as it’s worth, it is my favorite part of ‘Sticks, Stones and Breaking Bones’. 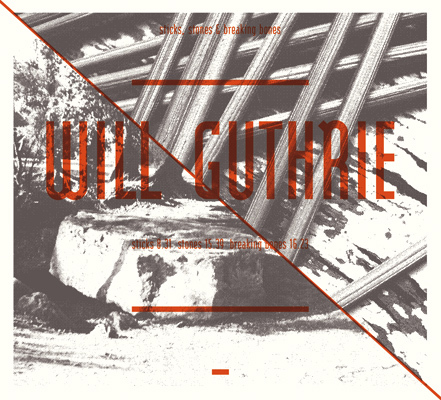 Guthrie presents a powerful display of his abilities, and for forty minutes he juggles between the meditative tribal ceremonies and the harsh scenery of a construction site. With only drums and percussions to his aid, Guthrie makes an amazing, interesting and vibrant album, and I am not even sure a bone was broken through it, for better or worse, I should say.